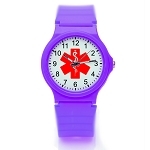 Check out these fun medical ID watches for kids! Available in several colors, all have the medical ID symbol on the front and may be engraved on the back with emergency medical information. The watch band straps are made of comfortable silicone rubber. The casebacks are stainless steel. 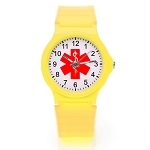 Although made for kids, the adjustable band fits both kids and adults!